In what follows, I would like to offer a little medley of anecdotes, originating from Ireland, Wales, or Anglo-Saxon England which I have either come across during my time as an undergraduate student, and remember very fondly, or have learned about more recently, and which have struck me as particularly fascinating. While my own background is in Celtic Studies, where I work especially on editing Old and Middle Irish texts (yes, from the original manuscripts), I’ve always had a fondness for the relationships that existed between various medieval civilisations and especially for contact between languages. During the year I spent as a Murphy Irish Exchange Fellow at Notre Dame, I also had the opportunity to study Greek and Latin with Profs. Mazurek and Mazurek, topping up on my knowledge of both of these languages pursued while studying in Ireland. 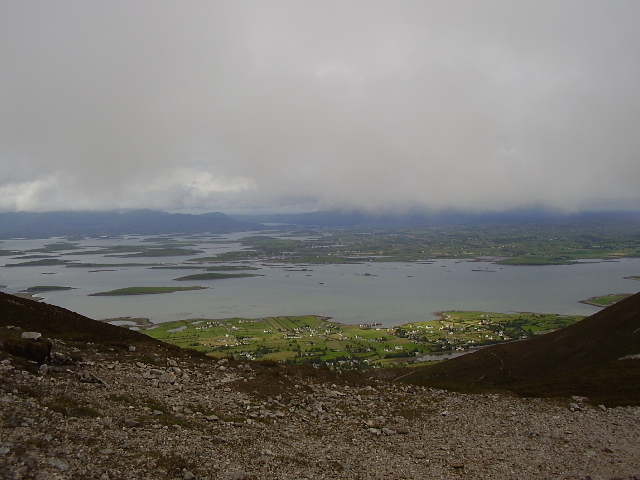 Below are four tales of linguistic contact, demonstrating scribal cleverness and competition, some riddles, the danger of studying in Ireland, and also information about reindeer. I hope you’ll enjoy! Every student of Old Irish, myself included, will at one stage have come across the Old Irish Glosses, and most of the time they will form the foundation of any beginner’s level Old Irish course. As a novice to this fascinating language, I naturally wondered what exactly glosses were and why they were so important. In John Strachan’s Old Irish Paradigms and Glosses, one of the standard teaching works, we find the complicated tables which ought to be learned off by heart by anyone wishing to have even the smallest sense of how the Old Irish verbal system works. But the bulk of the book is filled with practice sentences drawn from actual unadapted material (in contrast to the grammatical ‘safe-space’ that is E. G. Quin’s Old-Irish Workbook), and thus the adventurous student is plunged into the world of orthographical variation and grammatical uncertainty, the world of the Glosses. The primary sources for the student of Old Irish, which also provide the majority of the source material to Rudolf Thurneysen’s seminal Grammar of Old Irish, are interlinear and marginal notes written in Old Irish as commentary on Latin texts, found in manuscripts which are now, for the most part, kept in libraries in Continental Europe. One such source is a mid-ninth-century manuscript in the Stiftsbibliothek of St. Gallen in Switzerland, known as Codex Sangallensis904. It contains a copy of Priscian’s Institutiones Grammaticae (6th century), one of the most important sources for the instruction of Latin in the Middle Ages. To the student of Old Irish, this work is simply known as ‘the St. Gall Glosses’. As can be seen in the image below, the main text is written in large script, but in-between the lines and in the margins, we find much smaller annotations, explanations, and comments in Latin and in Old Irish. These are to a large extent explanatory teaching notes, as a knowledge of Latin was indispensable for understanding, studying, and also copying biblical texts, hagiography, or even computus. hi mbrot glass de dingnaib doss. I hear the wild birds jubilant. A cuckoo’s clear sing-song delights me. How well I write beneath the wood. This little poem is one of the highlights of medieval Irish nature poetry and was long held to be a reflection of the hermitic lifestyle of the medieval Irish monk until that assumption was challenged by Donnchadh Ó Corráin. In what might feel more recent, but was still twenty years ago this year, Patrick Ford made a fascinating contribution to the subject in challenging ‘the conventional scholarship that ignores the physical setting in which we find it [the poem]’. Ford was interested in the question, which had not before been asked, as to why this little poem had survived in this particular manuscript and on this particular page of Priscian’s Grammar, and confronted the practice of reading texts outside their manuscript contexts lest ‘the genre determines the meaning of the work’. But what exactly is the poem’s manuscript context? On f. 203 in the St. Gall copy of Priscian’s Grammar, the reader is treated to a description of the Latin pronominal system (this is part of Book 12 of De Figuris), specifically the distinctions between simple and compound pronouns, e.g. huiusmodi, mecum, etc. With this manuscript context in mind, Ford has made the ingenious argument that the scribe, far from musing about blackbirds and cuckoos, very much had pronouns on his mind. One of the most distinctive features of Old Irish (and, to a certain extent, also Welsh) are infixed pronouns. In the Old Irish verbal system, both the subject and the object of an action were expressed within the verbal complex, the former through the ending of a synthetic verb form, e.g. finnamar ‘Let us find out’, and the latter through a pronoun that was either suffixed to the verbal ending or inserted before the main verb with the help of a preverb or other particle. Thus, ‘He kills his enemy’ (as you do) is marbaid a námait, but ‘He kills him’ is either marbthai with a suffixed pronoun or na marba with an infixed pronoun (and the conjunct particle no as well as the dependent form of the verb). There is nothing equivalent to the infixed pronoun in Latin, however. Given that our little nature poem contains six pronouns in the space of eight lines, five of which are infixed pronouns and one possessive, Ford concluded that the scribe was engaging both critically and creatively with Priscian’s text: he responded to the idiosyncrasies of Latin pronominal compounding in the most Old Irish way possible—with a poem filled with infixed pronouns. While the poem of the scribe in the woods may be the most famous example of the creative interplay between Latin and Old Irish, it is far from the only one. The differences between Latin and Old Irish are most certainly not confined to the way both languages employ pronouns. One of the most striking differences between the two is the modal category of the infinitive. While most European languages have an infinitive (étudier, studieren, etc. ), Irish does not. But that does not mean that Latin infinitives are not glossed in Priscian and other Latin texts containing Old Irish glossing. See, for instance, the following examples occurring in the Old Irish glosses to the commentary on the Psalms contained in the Codex Ambrosianus C 301 inf, another ninth-century Irish manuscript now held at the Biblioteca Ambrosiana in Milan. On f. 15a 10, the word inficere is glossed fris-n-orr, literally ‘that he may injure’; on f. 78b 24, the deponent infinitive opinari is glossed with an Old Irish deponent form du-menammar ‘that we may opine’; and on f. 39b 3, supplicare is glossed with ṅges ‘that he may pray’. The Old Irish solution for the lack of an infinitive was to put the verb into the present subjunctive and employ a sub-clause construction known as a nasalising relative clause (this nasalisation is indicated by the ninnges and before the verbal stem in fris-n-orr). Dwelling for another moment on Priscian and the teaching of Latin in Irish monasteries, Irish scribes did not only ponder the differences between Latin and their own language, but also commented on the similarities or sought equivalent Irish solutions for a particular Latin phenomenon. A curious case of morphological creativity in the glosses on Priscian is the occurrence of what seem to be special comparative forms of certain adjectives. See for instance the two forms on f. 45, where the forms maánu ‘a little greater’ and laigéniu ‘a little smaller’ occur. These are to be understood as comparative forms of mór ‘great’ and becc ‘small’ (with adjectival suppletion) respectively, though their regular comparative forms are móo or máo and lagiu. The words glossed by máanu and laigéniu, respectively, are maiusculus and minusculus, again ‘a little greater’ and ‘a little smaller’. It appears then that the Latin teacher wanted to make his students understand that –cul is a Latin diminutive suffix which can express variation in the degree of comparison, specifically to what extent something is lesser or smaller than something else. And the Irish equivalent of such a diminutive suffix is én or án. Thus, laigiu becomes laigéniu and móo becomes maánu, creating nonce words for the sake of teaching. The Old Irish Glosses are a veritable treasure trove, and any student or scholar versed in the reading of insular minuscule should set the Thesaurus Paleohibernicus, the standard edition of the Old Irish Glosses, aside and look at the manuscripts directly. 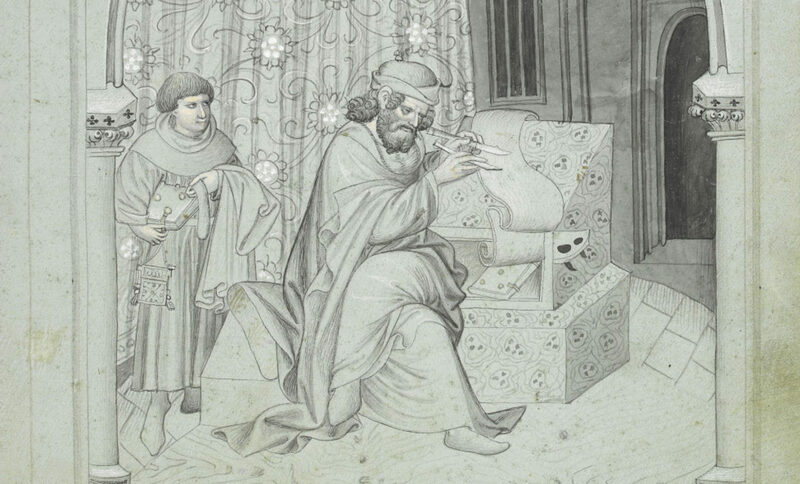 Fortunately, the St. Gall manuscript has been fully digitized and can be consulted free of charge. Our next stop on the journey of language contact is Wales, although we are taking a few Irish people along with us. One of the most intriguing riddles of medieval Western Christendom (in my not entirely unbiased opinion) is the cypher known as the ‘Bamberg Cryptogram’. 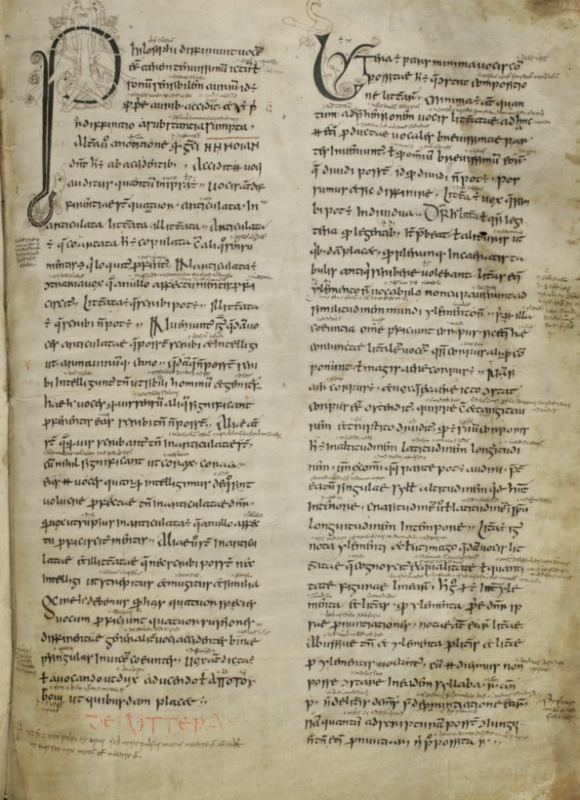 So called after one of its manuscript sources, a late-tenth-century codex held at the Staatsbibliothek Bamberg in Bavaria, the context of the cryptogram goes back to an Irish scholar named Dubthach mac Máel Tuile whose obit is recorded in 869. Dubthach was a most learned man, versed not only in Latin and, to a certain extent, Greek, but also in computus, cryptography, and cryptanalysis. The ‘Rosetta Stone’ to Dubthach’s cypher is provided by a letter written in Latin verse which gives the answer to the riddle (provided one is fluent in Latin, of course). This letter was sent by another Hiberno-Latin author named Suadbar, better known under the name Sedulius Scottus, another of the great ninth-century Irish scholars, to his master Colgu in Ireland. The context of the letter is Suadbar’s journey to the court of Merfyn Frych (d. 844), king of Gwynedd in North Wales, together with three companions. He tells us that scholars, such as himself and his fellow students, arriving from Ireland at the court of Merfyn are tested and given Dubthach’s cypher to decode. As David Howlett explains in the commentary to his edition of the cryptogram, the phrase is from the salutation of a letter from King Merfyn to Cyngen (Irish Conchen), king of Powys and brother to Merfyn’s wife Nest. The name of the king, Merfyn, in Welsh is here spelled in Irish orthography, where medial m would have the same phonetic value as f in Welsh, hence Mermen. Translated, the line means ‘Merfyn the king salutes Conchenn’. Let us hope that Suadbar’s fellow students back in Ireland were worthy of the answer! 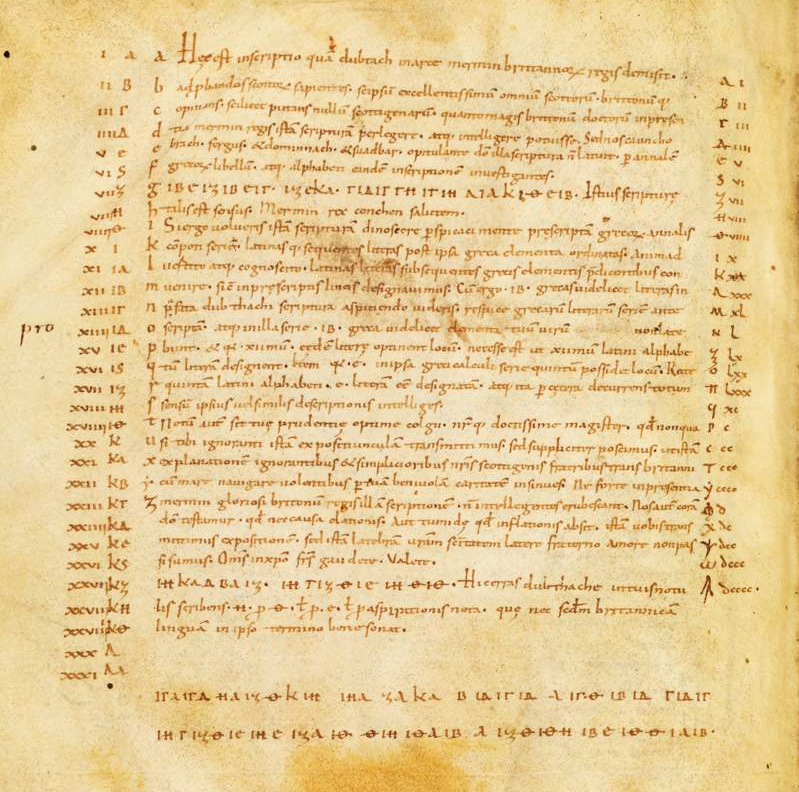 The complete manuscript is available here: https://www.e-codices.unifr.ch/en/list/one/csg/0904. 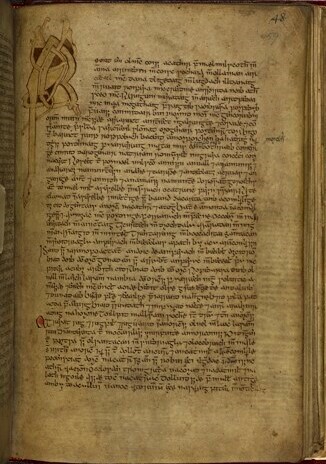 Ó Néill, Timothy, The Irish Hand. Scribes and Their Manuscripts from the Earliest Times. Cork, 2014: 30. Murphy, Gerard, Early Irish Lyrics. Dublin, 1956 (repr. 2007): 4. Ó Corráin, Donnchadh, ‘Early Irish hermit poetry?’, in D. Ó Corráin, L. Breatnach, and K. McCone (eds. ), Sages, Saints and Storytellers. Celtic Studies in Honour of Professor James Carney. Maynooth, 1989: 251-67. Ford, Patrick K., ‘Blackbirds, Cuckoos, and Infixed Pronouns. Another Context of Early Irish Nature Poetry’, in R. Black, W. Gillies, and R. Ó Maolalaigh (eds. ).Celtic Connections. Proceedings of the 10thInternational Congress of Celtic Studies, 1999: 162-170; 162-3. For more information about this manuscript, go here: https://www.vanhamel.nl/codecs/Milan,_Biblioteca_Ambrosiana,_MS_C_301_inf.See a newly developed project on these glosses here: https://www.univie.ac.at/indogermanistik/milan_glosses/. Stokes, Whitley and John Strachan (eds. ), Thesaurus Palaeohibernicus, 3 vols. Cambridge, 1903 (repr. 1987). Dubthach mac Máel Tuine, doctissimus Latinorum totius Europae, in Christo dormiuit‘Dubthach mac Máel Tuile, most learned of all the Latinists of Europe, died in Christ’ (Dáibhí Ó Cróinín, Early Medieval Ireland, 400-1200. London and New York, 1995: 236). The entire manuscript is digitized here: https://zendsbb.digitale-sammlungen.de/db/0000/sbb00000081/images/index.html?id=00000081&fip=216.183.48.102&no=1&seite=1&signatur=Msc.Class.6. Chadwick, Nora K., ‘Early culture and learning in North Wales,’ in N. Chadwick, K. Hughes, C. Brooke, and K. Jackson, Studies in the Early British Church. Cambridge, 1958: 29-120; 96. Howlett, David, ‘Two Irish Jokes’, in Pádraic Moran and Immo Warntjes (eds. ), Early Medieval Ireland and Europe: Chronology, Contacts, Scholarship.A Festschrift for Dáibhí Ó Cróinín. Turnhout, 2015: 225-264; 243. Owain broke through to the sleeping area and took Nest and her children, burning the castle as he left. Gerald of Wales tells us, however, that Owain raped Nest and then returned home, making no mention of Owain taking Nest with him, so there are somewhat conflicting accounts. As told in the Brut y Tywysogion, though, Owain’s father Cadwgan urged Owain to return Nest to her husband, but he refused. Nest then pleaded with Owain on behalf of her children, saying: ‘If thou will have me faithful to thee, and remain with thee, send my children to their father’. It is generally considered that Owain did abduct Nest. But whether she was party to the attack as suggested by Lloyd, who states that the whole affair was a tale of passion and intrigue, or she was an unwilling victim cannot be substantiated. That this was an act of rebellion against Norman incursions is a more feasible argument. Although stories abound as to where Nest and Owain went after her abduction, no reliable evidence exists to confirm them. Susan M. Johns relies on Henry Morton’s 1932 volume In Search of Wales, which suggests that they ‘ran to Powys’ and stayed at a hunting lodge called Plas Uchaf in Eglwyseg. Gwen Meredith suggests that Nest stayed with Owain for three years and that they had two sons, Llewellyn and Einion. However, I would suggest that Nest was quickly returned to Gerald, possibly at the same time as her children. King Henry was rightly furious and was quick to act; taking the king’s mistress was one thing, kidnapping his son quite another. Henry brought the wrath of God down on Wales in his search for Owain by sending his man Richard de Belamais, the Bishop of London, to track Owain down. Owain escaped to Ireland, but while on the run, it would make sense that he would not have wished to be encumbered with Nest. Nevertheless, Nest’s abduction set Wales ablaze, Normans against Welsh and Welsh against their own in a civil war. On behalf of Henry, Bishop Richard offered Owain’s cousins Ithel and Madog ab Rhiryd vast tracts of land to turn over Owain. These two invaded Ceredigion, scattering the inhabitants to any place of safety they could find and brutalising the population as they went, but they never did find Owain. It appears that later Madog changed his allegiance. Once Owain had returned from Ireland, he and Madog burned Meirionydd, killing many and slaughtering their cattle. Owain continued to be a thorn in Henry’s side and continued to avoid capture. He returned to Ceredigion, once again on the rampage, killing and terrorising as he went. In 1111, Madog ap Rhiryd killed Owain’s father, why we do not know. Owain sought revenge and caught up with Madog and blinded him. After years of constant revolt against King Henry, Owain was finally forgiven by the king and knighted in 1114. A curious act by Henry, did he believe Owain could be useful to him? Owain’s meteoric rise in Henry’s favour is intriguing, especially given the statement in the Brut y Tywysogion saying that Gerald was ‘Henry’s particular friend’. At this point, we may consider the vague possibility that Nest was again with Owain and was returned as a part of the bargain. 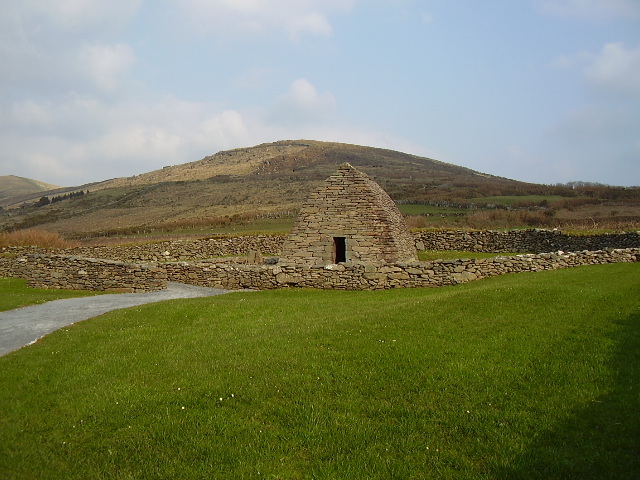 In 1113, Gruffydd ap Rhys, Nest’s brother, returned from exile in Ireland determined to retake his father’s kingdom. Records show he stayed from time to time with Nest and Gerald at Pembroke Castle. Young Welshmen flocked to Gruffydd’s cause as he left a trail of destruction throughout the South. Henry, angered at Gruffydd’s actions, ordered Owain and Gerald to find him. Nest’s feelings regarding Gruffydd’s actions are unknown. However, that Henry would use Owain and Gerald to bring Gruffydd to heel must have felt like the ultimate betrayal. While looking for Gruffydd, Gerald marched with his army to the forests of Ystrad-Tywi. There, Gerald came across settlers that complained to him of the brutal treatment received at the hands of Owain. Gerald decided the time was ripe to take his revenge against Owain. Believing that Gerald had come to assist in bringing down Gruffydd, Owain was instead attacked by Gerald’s forces with a volley of arrows. Owain died from an arrow to his heart, which, given his passion for Nest, seems quite fated. No mention is made in the chronicle evidence of what happened to Gerald at this point. Had he died alongside Owain, it would have been recorded along with Owain’s death. Was Gerald injured in the skirmish and died later from his wounds? History does not tell us. Plausible is the idea that Henry’s actions towards Owain were considered by Gerald a betrayal. It could also be that Gerald was tired of sharing his wife with so many men, the king included, and took his frustration out on Owain and left court. His options would have been few if he wished to keep his family safe and secure. It is possible that he took up the cross and travelled to the Holy Land, but we simply do not know. D. Walker tells us that Gerald died in 1136. However, William Hait became the constable of Pembroke in 1130, which suggests that Gerald was not in residence at the time. This strengthens the argument that Gerald had either fled, died, or was suffering a prolonged illness that took him out of the record books. Of Nest’s potentially fourteen children, history does not give reliable dates of their births or their deaths. That she had four children by Gerald is documented by various sources; that she had ten further children is less easy to confirm. She bore Hait, the Constable of Pembroke, a son, William Lord of St. Clears. She also had a son, Robert Fitz Stephen, by Stephen, the Constable of Cardigan, whom she had married after Gerald’s death. While their birth dates may not be reliably documented, they feature prominently in history. There were four further children by fathers unknown, plus the possibility that Nest also had two sons by Owain. It would be easy to label Nest as promiscuous, given the number of children she had by various men, but the fact that we have no firm evidence of the dates they were born does allow for us to be a little more lenient towards her. I have often considered her unfairly treated in the scholarship. She was forced into situations that were beyond her control, as was the case for many women in the Middle Ages, and that she used the beauty and charms she possessed to make a comfortable and safe life for herself and her children would have been very reasonable, given her circumstances. We must also consider that it would have been prudent for the king to see his mistress married successively to two Norman lords (Gerald and then Stephen), thus keeping her and her children under his influence. Being a daughter of the King of Deheubarth made her a target for those who would use her as leverage against the Normans. We have no reliable evidence for the date of her death, nor do we know where she is buried. What we do know is that she left a legacy that has survived through time by means of her children and grandchildren. If Nest herself is not remembered well by the historians, her children by the various men in her life have been. They were born with a mixture of both Welsh and Norman blood in their veins and went on to lay the foundations for some of the major houses in both Wales and Ireland. Nest and Gerald’s daughter Angharad married William Fitz Odo de Barry, and their son, Gerald de Barry, is better known to us as the prolific writer and priest Gerald of Wales. Robert Fitz Stephen and his half-brother, Maurice Fitz Gerald, ensured a long line of Fitz Geralds in Ireland by successfully gaining vast tracts of land through either battle or reward. They built castles and established a lasting Fitz Gerald dynasty, which includes the 35th President of the United States, John Fitzgerald Kennedy. Giraldus Cambrensis, Expugnatio Hibernica: The Conquest of Ireland, edited and translated by A. B. Scott and F. X. Martin (Dublin: Royal Irish Academy, 1978), pp.229-30. Lloyd, History of Wales, Volume ii, p.417-48. Johns, Gender, Nation and Conquest in the High Middle Ages, pp.196-198. Henry Morton was a travel writer who took pleasure in portraying Wales as a place of romance and legends to entertain his readers. However, there is an Elizabethan manor house in Eglwyseg known as Plas Uchaf built on the foundations of a hunting lodge which once belonged to the princes of Powys. An inscription can be seen over the door telling how the lodge was inherited by the princes of Powys in 1073. G. Meredith, ‘Henry I’s Concubines’, Essays in Medieval Studies 19 (2002): p.17. Available: http://muse.jhu.edu/article/39657. Access provided by University of Wales Trinity Saint David. <accessed 4th July 2016>. P. A. Taylor, Nest Ferch Rhys ap Tewdwr, p.33. Lloyd, History of Wales, Volume ii, p.433. Rev. W. Warrington, The History of Wales in Nine Books, vol.1, Bk. V (Brecon: Williams, 1823), p.432. Johns, Gender, Nation and Conquest in the High Middle Ages, p.22. D. Walker, ‘Gerald of Windsor (d. 1116×36)’, Oxford Dictionary of National Biography (2004) [online]. Available: http://www.oxforddnb.com/view/article/45551. <accessed 23rd November 2016>. Lloyd, History of Wales, Volume ii, p.424.